It is said that food is a universal language, and why wouldn't it be? After all, every living creature needs to eat to stave off death, if nothing else. But more than that, sharing a meal with other people is often a great way to socialize and form connections. Within the scope of my real life relationships, most of were forged, in part, while eating together. From the high school cafeteria to a night out at a restaurant, most people can readily recall eating out with friends and family. So then why is it that an activity as normal as dining with other people so rarely depicted in video games? While I was in the middle of my playthrough of Bravely Second, I noticed that there were a plethora of scenes where the party got together and not only ate as a group, but talked about the various delicacies of the towns they visited. At first, I thought it was weird that such a small detail stood out to me. The more I pondered it, the more I realized that such scenes stood out because aside from the previous game and the Persona franchise there aren’t many other games where protagonists just eat together. That’s a shame, because there is so much potential in those little interactions for both character and world-building. It is true that a lot of games utilize food in some way. Food is often used as a restorative item, like in Bioshock: Infinite, Fallout 3, and most survival games. However, food is frequently just something that the protagonist consumes for the enjoyment. In games like these, food is purely utilitarian. Players eat only to increase numbers. While there is certainly simulationist value in that, the more social aspects of dining aren't depicted in games as much. And those social elements of dining can be valuable tools in the designer’s tool belt. Just like in real life, having characters eat together can serve as a catalyst for conversation. In Bravely Second, many dungeons will offer a point where players can set up camp and rest. Though the game incentivizes them by fully healing party HP/MP, they also show completely optional scenes where party members chat with each other -- often over a meal. These scenes involve the cast opening up to each other about things going on in their lives and what kind of things they've seen on their journey. One scene in a dungeon crawling with ghosts and zombies has lead character Yew (Yes, “you”) Geneolgia lamenting his fear of ghosts. This fear is so great that his shoulders and back have become sore after all the tensing and crunching caused by wandering the halls of the under. With the ice on the topic broken, the others open up to share some of their fears and how (or if) they've learned ways to deal with them. Persona 4 also has examples of this type uses dining as a venue for character interaction. Over the course of the game, the Investigation Team is often shown eating together, making idle small talk. Sometimes they talk about the latest developments in the homicide case, but often the subject will be things like upcoming exams, school trips, and other such mundane events. Seeing how each person in the group reacts to something like an upcoming exam can be a great window into their life. Watching Yosuke cringe at the prospect while Yukiko takes it in full stride tells me more than someone else calling them an idiot and a genius respectively. It isn’t necessary to have this conversation over a group meal, but having the party eat together makes it much easier to naturally have these moments. Even if the party doesn't directly talk about themselves, often the kinds of foods they prefer can reveal a lot about them. In fiction, each culinary palate has a number of stereotypes classically associated with it. Writers can and will use these as shortcuts to tell their audiences more about the cast without having to waste time with exposition. Even if you don't think about them, you're probably at least aware of their presence. If I mentioned that Edea, one of the party members in Bravely Second, puts ketchup on many of the foods she eats, and prefers to eat extremely sweet or extraordinarily spicy foods, then you probably have an image of someone with an intense personality. Like the foods she eats, she tends toward the extreme in the her actions and reactions. Even if the game didn't show much of Edea outside of the scenes where the party dines together, this information could be gleaned just from her tastes. Similarly, Persona 4 makes use of this narrative technique, but not quite in the same way. Generally, the better you are at cooking in Persona 4, the more self-reliant you are. People like the protagonist and Nanako, whose parents are rarely around, are able to cook so well that the others are left in awe at their culinary skill. 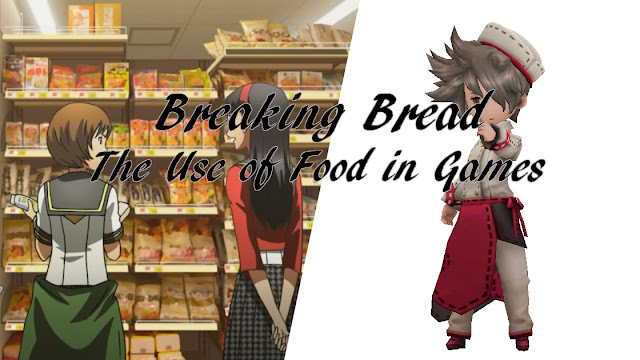 Yet characters like Yukiko and Chie, who aren’t so self-reliant, are the worst cooks in the group, and their fellows will often go to great lengths to avoid consuming their “Mystery Food X”. Party members like Rise and Naoto, who tend to be fairly lonely even if interact with others regularly, tow a middle line in cooking skill. Rise can generally cook, but tends to overly spice and Naoto only knows enough to be able to follow instructions on the back of pre-packaged foods. Regardless, their skill at preparing great tasting food and their friends’ reactions to it reveal much about their home lives. It feels strange pointing out the way writers can use the act of eating to tell us more about the teams they create, but examples are so few and far in between that I am compelled to do so. It’s easy to for a writer to just have a character tell their audience about themselves and the world around them. At the same time, it is one of the least engaging ways to present such information. I present this use of group dining as only one possible alternative to keep exposition to a minimum while still allowing for character and world-building. There are countless other ways to achieve the same end. I advocate exploring and making use of them as well.